This set is the perfect starter kit to encourage first words. 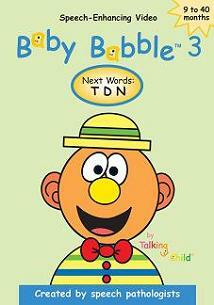 The Baby Babble Series is an award winning series designed to expose your child to early developing sounds and words. Baby Babble 1, 2, 3 & Beginning Words are engaging speech-enhancing videos prepared by speech-language pathologists for both you and your precious child. Each video contains a child segment that your child can watch repeatedly to practice new words and sounds. A parent tutorial is also included with numerous tips and ideas for parents. 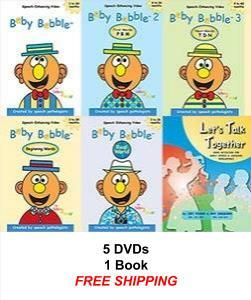 The Let's Talk Together Book provides over 55 home activities for early speech and language development. Let's Talk Together includes favorite language activities that take place in a child's natural environment -- including but not limited to mealtime, indoor play, outdoor play, car time, and night time routines.